On software, running, and everything else. To improve the reader experience, this blog moved to http://runningdev.tumblr.com/. After quite a long period off, it's about time to get into running again. Unbelievable - I haven't been running since July 2010 except for some runs not worth mentioning in between. Today, I finally ended that streak after getting inspired by watching the Vienna City Marathon and London Marathon coverages. Seeing these races reminded me of all the positive and exciting facets of running that I've experienced in the past. It's not only about racing - it's also about the training runs that I put in to come that far. It's always been a thrilling ride to prepare for the one day where it counts and you have to recall the confidence you gains from countless runs in preparation for the event. 5k was my goal today, just an easy 5k at around 6min/k. I expected it to be less straightforward that usual, I knew it would take more effort. However, I didn't anticipate just how different and difficult it was going to be. How have I ever been capable of running at sub-4min pace, let alone capable of running 42 kilometers? Despite an almost embarrassingly slow pace, my heart race was through the roof right from the beginning, even during the first kilometer. I was taking it slow to ease into the game again, but it seems it wasn't slow enough... Only five kilometers, obviously enough to make the workout unusually exhausting. "Come on, come on! ", I exclaimed silently as I was stuck in traffic on the Staten Island Expressway with several other runners, heading to the start. The day has arrived. With only one and a half hours to go, the excitement rose with every minute that passed. So, although we were probably going to make it in time, I certainly had no intention to take my chances - after all, "losing" the race before it actually began would have been tragic. As a genuine newbie to this event extraordinaire, I could not know what to expect. 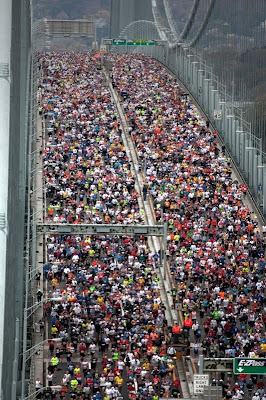 It's the New York City Marathon, the world's largest marathon by a distance - anything was possible! More than 43,000 people had to be accommodated in the start villages at and around Fort Wadsworth, a former United States military installation, next to the Verrazano-Narrows bridge. Every single one of them had earned their presence throughout the previous months by dedicating part of their lives to preparing for the event. Indeed, it's only about the last 42k that day, the last of countless kilometers completed in anticipation of the final long run. It might sound easy from that angle but it was clear that the ultimate stage would be all other than a piece of cake. Before the test could begin, every single one of us had to make our way through the monstrous amounts of marathon enthusiasts to get to our assigned start villages, baggage trucks, one of thousands and thousands of porta-potties, and eventually, the designated starting area. When we arrived, most of our fellow participants had already made themselves comfortable in the start villages for the last couple of hours. Involuntarily so, I guess. The use of official transportation to the start provided by the event not only meant having to get up earlier than usual for a marathon, it also implied arriving at Fort Wadsworth around 3-4 hours before the gun (so I've been told). Quite some time to kill. For one, you could use it to have a carbohydrate-rich breakfast (plenty of food and beverages were provided), something you probably missed to make the trip to Staten Island. Things were moving slowly in the sea of runners on Staten Island. Considering the scale, however, it wasn't as dramatic as it could have been - I expected worse. Some guys were relaxing in the green while waiting for their wave start to open. Others rushed from A to B, seemingly confused by logistics: wave, corral, orange, green, blue. My initial endeavor was to deposit my baggage for the day that could later be reclaimed in the finisher area. Getting around wasn't much of an issue. With short lines in front of UPS trucks, that was done within minutes. Nevertheless, time went by. One hour to the start. Loudspeaker announcements in multiple languages including German and Japanese indicated that corrals for wave #2 - my wave - were open now. That was it, time to get moving! So, I followed the signs to find my corral, corral B. Up until corral E, there was essentially no line - enough space for everyone to proceed to their corrals. Things went downhill from there. An alley that was less than two meters wide turned out to be the answer on how to get from E to D and above. Needless to say, a major bottleneck in a major marathon in its 40th installment. 9:40am. While waiting in line, shoulder to shoulder with fellow #2 wavers, #1 started. First, and most important for events in the United States, the national anthem was performed live and honored with raging applause. Shortly thereafter, the gun was fired to start the race for the first 14,000 participants, including elite runners. Frank Sinatra's New York, New York was sounding throughout the area - an NYC marathon tradition. It goes without saying that all waves were sent on the 26.2 mile journey with the very same ceremony. The second wave was about to start but I still hadn't reached my designated corral yet. My calm slowly but surely turned into anxiety. The line was blocked, not moving anymore. "What's going on? I need to get into my corral! ", I said to myself. Speculation started, rumor had it that the wave was closed already. Did we have to fall back to the last wave? Strange, even one of the official pacemakers of wave #2 didn't make it and was standing in the same line, right next to me, as eager to get in there as we all were. 9:55am. The wave began to move forward, towards the bridge. Some of the runners who had been stuck in our line climbed across the fences, supposedly out of "panic". Tempting, yet too drastic of a way to get through. Minutes later, the line was moving again and we were finally able to join the crowd that was already on the way to the start. I took the opportunity to make one hopefully last visit to one of the thousands of porta-potties (even in the corrals, the whole right side was filled with them) to avoid unpleasant surprises during the next 3-4 hours. "Should I wait for wave #3 instead? ", I was asking myself for a way to make the best of it. Sure enough, I was in the last corral now that most of the starters had passed us already. So, waiting for the next wave might have allowed me and others to start in the front. While it seemed like an excellent idea and workaround, I still went ahead with #2 - I was just glad to have gotten to the point of racing. The crowd was moving. Actually, the wave had started already. I don't know about the others, but orange corral access was suboptimal. Judging from various other postings, several others faced the same problem. Even though the bottleneck was by design, it probably could have been avoided by arriving 30-60 minutes earlier. I crossed the starting line and enabled my clock. Now, it's only the 26.2 and me - and at least 14,000 others who could easily interfere with my plans. The Verrazano-Narrows bridge is enormous. Twelve lanes that normally lead cars from A to B on two decks. I had an orange bib, meaning that I crossed the bridge on the top deck. Before arriving in the US, I had been toying with the idea of doing a test run across Verrazano-Narrows as part of one of the last training runs. At that point I didn't know, however, that there was simply no way because the bridge doesn't allow pedestrian access. What a shame. The incline felt easy. The bridge itself was quite long with around two miles total, the climb was hardly noticeable. It's the beginning of a long trip, a strange feeling. You make your first strides knowing that you have three to four hours of running ahead of you. I tried not to bother with that thought, it wouldn't have made sense to worry about the distance at that point. As we made our way to the top, the New York skyline became visible in the distance - that was quite an impressive view. The weather was perfect. No rain (not at the time of the start and thereafter anyway), comfortable temperatures and, last but not least, clear views. Runners pulled out their cameras to conserve memories on film. Way before the race, I was wondering about the crowd and how it might become a factor in me approaching and maintaining my goal pace. It's one of the biggest crowds out there, so that certainly was to be expected. Plus, with me starting in the back, that was almost guaranteed. Consequently, I did what I thought I had to do. I settled for a moderate pace for the first two miles and tried to make my way through the crowd by struggling through holes that opened and closed as people were moving. Moving up to 4:30min/k wouldn't work, I concluded with disappointment. There was no improvement in sight. My Garmin Forerunner indicated a pace of 5:40min/k. "Oh my!". I lurked for every opening that developed, slowing down and speeding up to make sure that I wouldn't be totally off my plan. Surely, nobody is coming to New York to run an earth-shattering personal best because the difficulty of the course usually does not allow for that and New York is more about the experience anyway. Still, I had no intention to run at a pace that was way below what would've been possible. I definitely didn't want it to be yet another long run. I did plenty of them in training, I wanted a race. The miles flew by. I was amazed how fast they actually did. 2, 4, 6, 8, 10. Almost made it to the halfway point. The massive number of runners was still an issue, though. As the two streams coming off the bridge were only separated by some kind of plastic tape, I attempted to run next to the tape to overtake others. As you can imagine, that did not always work and often required slowing down to avoid collisions. The situation changed for the better in the later stages of the marathon but it never really cleared up to a level I felt comfortable with. At the halfway point, I knew that I had already lost around 7 minutes (1:41h) and, quite possibly, had wasted more energy than I could afford. What followed was a long stretch of ups and downs leading to the Bronx. The marathon hadn't actually started, after all we hadn't reached mile 20 yet. Still, I had to fight with deep fatigue already that wanted me to stop and throw it all away. "Why the heck are you running 26.2 miles? Use the subway! You're on vacation. Stop and rest immediately, it'll feel fantastic! ", my mind attempted to trick me. You would think that the declines help to conserve energy and regain control of yourself. From my experience, they usually do. At that point in the race, however, even downhills turned out to be painful, there was nothing left that could even be remotely associated with the concept of comfort. I was encouraged by the masses, who, just like me, continued to pull and move through these rough patches that you are bound to experience in events like this one. I welcomed every single aid station with open arms, consumed sports drinks and water to save what's left. My heart rate reached an uncomfortable level already. As we came closer to the Bronx, my pace was declining steadily. I didn't have anything to conquer my mind that tried just about anything to succeed in achieving my surrender - noble intentions but not at all helpful. If only I could have used that creativity to turn it all around. Finally! The Bronx, and with it: the 20 mile mark. Only 12 kilometers and some change left - "only". The segment in the Bronx was short, yet filled with energetic spectators. Judging from my pace, I knew that I was locked into survival mode now, merely trying to make it to the finish line. I calculated the projected finish time over and over again to distract myself, it was all other than comforting. We reached mile 21 as we left the Bronx over the Madison Avenue bridge and were heading towards Central Park, the final stage of the race. Well, actually, Central Park was still a few miles away. At some point, you thought you were there already because trees started to appear next to the course, but that only turned out to be yet another park along the course. At around mile 22, we actually entered fifth avenue again. Central Park was indeed ahead this time - it was far from over, though. Central Park translates to inclines, many of them. I was eagerly awaiting the turn into the park because I knew that once we did, we were actually "almost there". 24 miles. Eventually, the barrier led into the park. Quite a number of people left and right along the road. "Almost there!". I attempted to pick up the pace but there simply was no way! I couldn't repeat the fantastic finish of my half-marathon test race, where I had run the last 4 kilometers near 4:10min/k and had finished with a sprint up to 3:00min/k to get below 1:35h. In the last 400 meters, I had been encouraged by the words of a couple that had run next to me. The guy had realized that 1:35 had still been within reach if only they had picked up the pace. "Kum. Des geht si nu aus. Ziag durch! ", he had exclaimed in Austrian dialect ("Come on. We can make it. Pull through!"). Unfortunately, she hadn't been able to respond but I had taken advantage of my higher pace and had initiated the final sprint. Sure enough, I was running a marathon in New York, a whole different category of race. I was on the other side this time and couldn't respond to my own request. So I tried to fall back to maintaining my pace, the very least I could do in the light of my 21 weeks of training. 25 miles. "You got the loudest shoes in the race! ", a guy shouted at me, referring to my Adidas adiZero Adios racing flats in luminous yellow. One of those amusing comments that'd have cheered me up if I didn't happen to have one more mile to kill. Two kilometers, to make things worse. Every single step took a great deal of effort at that point. My inner voice still attempted to convince me to give it up and rest. It did not stand a change though, not with around one kilometer remaining as we left the park to turn right onto Central Park South by the Plaza Hotel. Huge crowds pushed us along the uphill stretch that lead into the park and towards the long-awaited conclusion of the race. They were everywhere now. I visualized the last kilometer of practically all my training runs, a kilometer that did not actually seem all that long, a kilometer that I knew very well and usually honored with an effortless fast finish. 26 miles. Only one last hill. There it was: the blue gate I visited the day before, the final waypoint I have been longing for, the finish line I have been envisioning to cross during countless hours of training in celebration of a victory alongside 43,000 birds of a feather, finally emerged in front of me in its full glory. 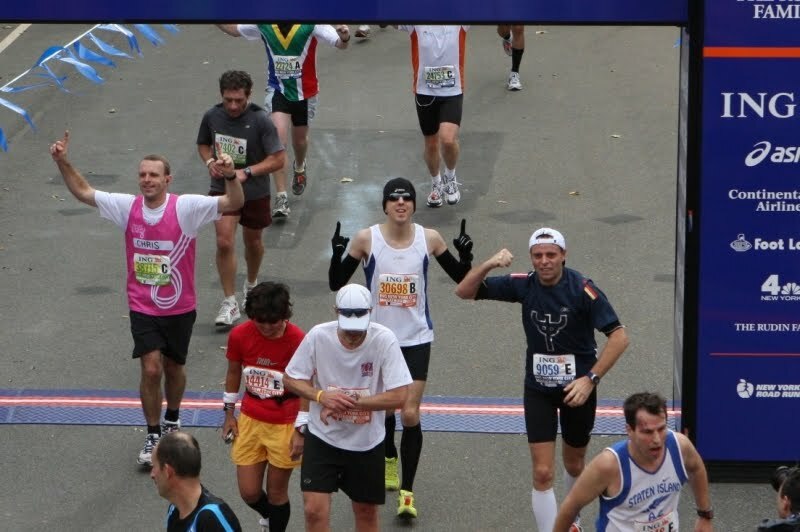 I crossed the line with an attempt to transfer my enthusiasm to the finish line photo. The moment I have been looking forward to, the moment that ended another thrilling adventure - coming to a halt after 42.195 kilometers, transitioning from continuous running to the relieving sensation of a victory walk after 3:37:29. I joined the stream of finishers, waiting to be awarded my NYC medal, have a finisher photo taken, and receive some post-race nutrition for easing recovery. I sat on the sidewalk for some minutes while resting and refueling. Volunteers constantly monitored finishers' conditions to rule out medical issues for each and every one of us. Wrapped in a space blanket, I continued my way through the finisher area to pick up the baggage I handed in back on Staten Island. I've been warned that this was going to take a long time, after all thousands of satisfied yet tired NYC conquerors were eager to do the same and leave. The single line of UPS trucks was long, people moved slowly. I'm not sure how much time I actually spent in there to get to my stuff and out of the park, but it might have very well been more than 45 minutes. A breeze compared to the last 3 some hours. Getting hold of a taxi was practically impossible at the time. All of them were busy. So, I decided to opt for the less convenient route instead, walked to the next subway station to get to South Ferry, hop on the ferry and take the bus to my hotel on Staten Island. While the long way ahead of me didn't exactly brighten my day (I would arrive almost four hours after the finish), I was astonished by the number of New Yorkers who acknowledged my participation with a "Congrats!" here and "Congratulations!" there, just like that. On my way, I had several nice conversations that resulted from the enthusiasm locals showed for the event and their runners. I can't say I've experienced anything like this before, the whole city participated in one way or another - it really was their event, too. In retrospect, it's clear to me now that I entered the race with an unrealistic goal, a goal that was out-of-reach. The fact that I missed my corral and had to make my way through the running crowd during the race certainly did not help. As expected, the course was tough, I was preparing for it in training by adding hill running and inclines to workouts and long runs. My training lasted for five and a half months, mileage peaked at 94 km per week. In the last month, it became increasingly difficult to follow the plan and keep the mileage up. For one, I think that my mileage was way too high in the weeks before that, leading to overtraining. I had never experienced the state of "overtraining" before, but it definitely felt like it. Additionally, I had to fight with a serious cold (including a period of elevated temperature) throughout the last four weeks, I never fully recovered up until the last week before the race. Ironically, I ran my best half-marathon race during that time period, 1:34:26. I guess I lost most of my shape during the last month as the mileage declined dramatically, not according to plans. Despite other factors and potential overtraining, it seems that a 6 month preparation is too long for me to maintain my fitness and full motivation, 12 weeks seem to have worked much better in the past. My goal was beyond what prediction results from test races allowed for. 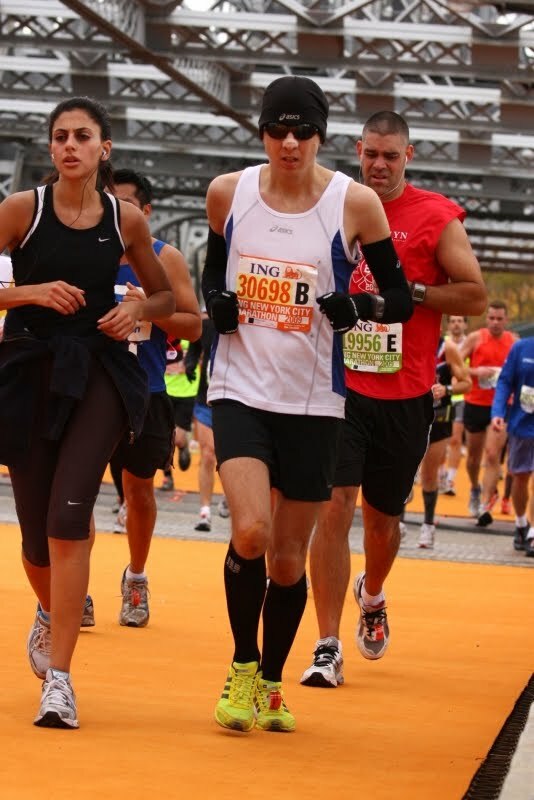 The half-marathon test seemed very easy, consequently I adjusted my goal with confidence. In any case, it would have been better to start with the more conservative goal in mind or to lower my expectations ealier in the race when it became apparent that I wouldn't be able to maintain the pace anyway because of the blocking crowd. During the last 12k, I was not as strong as I had been weeks before the race. The pace declined rapidly. With an even pace throughout the first and second half (including a stronger finish), something in the area of 3:23-3:26 should have been possible. If you cannot execute your plan to the full extent, there's always the felling of disappointment. Without a doubt and despite all of these considerations, 3:37 means progress - a significant improvement over my previous two attempts. The last 6 months have been quite a learning experience. I added a number of new training elements, some of which turned out to be very beneficial. Now, it is time to rest, draw conclusions, and start a new attempt based on the lessons learned from New York when it feels right to do so. The moment of truth is on the horizon. I was fortunate enough to be selected in the race lottery drawing. 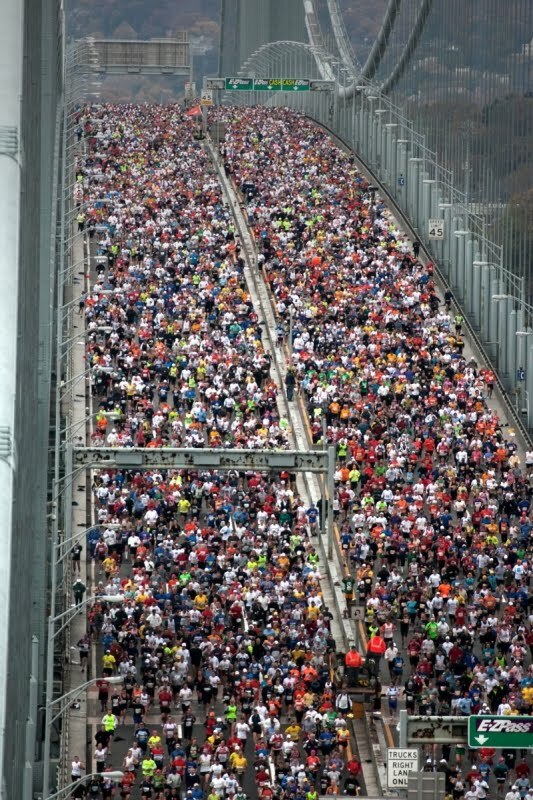 Now, The New York City Marathon is only three weeks away. Not exactly plenty of time. To be frank, I have mixed emotions. It's definitely going to be a thrilling experience, like Dubai was. I haven't been to NYC in more than seven years, so I'm in for a treat as I return to this extraordinary metropolis, the busiest "beehive" of all. The other side of the coin is the uncertainty that is lingering until then. You can never be sure if your preparation was good enough until you're actually taken to the test, you have to be in it to know it - plain and simple. When I sign up for a marathon - this one being number three - I have a specific goal in mind. I have a competitive personality. For some people, it's enough to be part of it, to enjoy the experience. Undoubtedly, New York is the perfect choice for an experience of a lifetime. Others, including me, go for it with a time goal, with the intention to set a new personal record. That doesn't mean it's going to be less of a great ride. I enjoy the challenge, challenging myself. 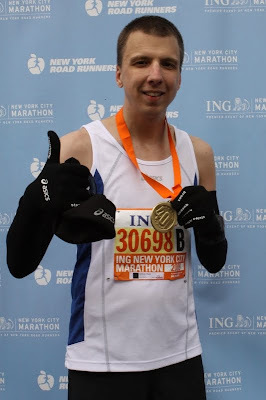 I find it interesting to see how far I can go in the marathon, what can a software engineer who hadn't been involved in any kind of sports before 2007 accomplish with determination and the right level of training? Throughout the last three weeks, I had a chance to taste two slices of Big Apple. The Wachau Marathon 10k race represented one of the two test races that are part of my marathon build-up. Test races allow you to objectively determine your current status in training. Is the marathon goal realistic or does it have to be adjusted based on the test race outcome? I'm not a particular fan of 10k's, race pace is usually only slightly slower than your 1k interval pace. You're in a constant struggle to maintain the target pace if you go for the maximum. 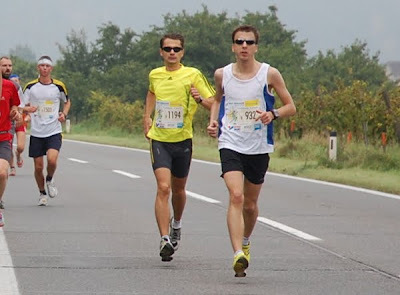 As you move up to the half-marathon and marathon, the pace becomes more moderate, relatively "comfortable" for most of the race. I felt great in the last interval session before the race (3:54/3:46/3:53/3:52/3:55min/k). While I still have respect for anything near 4:00min/k, I find it much more manageable now. With around 3 kilometers of warmup, including short sprints at race pace, I entered the race. My goal was to stay as close to 4:00min/k as possible. Unsurprisingly, that was relatively easy througout the first 2k but became considerable harder thereafter. In contrast to the Linz marathon build-up, the comfort faded with the 2k mark and never returned except for some short periods during the race. In that race (00:45:03 in April), the race pace of 4:30min/k was comfortable for around 8k, I even had enough reserves to accelerate during the last kilometer. Three week ago, the race was much more difficult. I completed the 10k in 00:41:59, which is a new personal record. The absolute maximum, I could not have gone further. 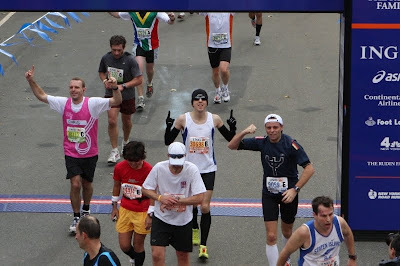 A fast finish was impossible, I was glad to have completed the race. 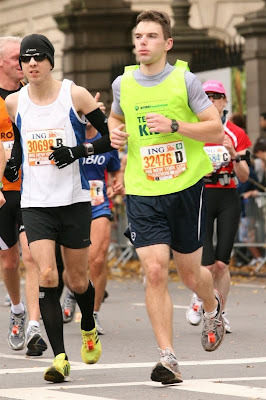 In retrospect, I think that I started out too fast and therefore suffered quite early and throughout the race. I had a goal in mind that was too ambitious, a goal that was beyond the required time for my marathon target. The race relentlessly reminded me of my current capabilities and, most importantly, provided me with a pretty accurate indicator for other distances. With an average pace of 4:11min/k, I'm still satisfied with the outcome. It's roughly in line with my marathon goal and, after all, a considerable improvement (00:03:04) over the last PR after only 6 months. Last week was even more crucial. I particiated in the Bad Ischl Kaiserlauf, a half-marathon. Unfortunately, I was not up to my game due to a cold I had developed some days before the event. It was a difficult decision, but I eventually decided to take part while not pushing for the maximum. The higher than usual heart rate indicated that there was no way to go for the required goal pace. Instead, I settled for running solely pulse-guided, without monitoring the pace. 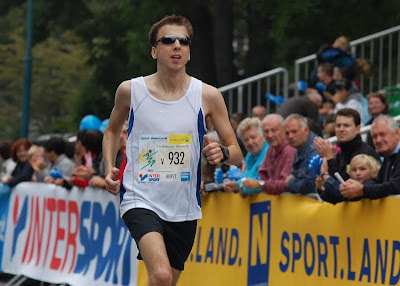 Despite my handicap, I felt surprisingly good all the way to the finish line, I even managed to accelerate in the last 4 kilometers and sprint to the finish to complete the half in less than 1:35, the result was 1:34:26, a new PR (01:40:50 in April; -00:06:24). I many ways, this was the best and worst race of my life. I was forced to hold back to be on the safe side, yet I've never experienced a more comfortable half-marathon race. So, all I take away from Bad Ischl is confidence. A half has never been that easy and enjoyable for me. Plus, I learned that running pulse-guided can lead to unexpectedly good results because you never exceed heart rate thresholds while trying to maintain a specific pace - instead, you account for the course and your current condition and automatically run at optimal pace for the current cardiovascular effort. In perfect condition, 1:32 should have been possible, I guess. Of course, I won't repeat the test race to find out. I walk away knowing that I would have had the capacity to finish faster and run a longer distance. In any case, this is not the time to rest - yet. NYC is coming, a mere three weeks remain! With 1,032k worth of training in the pocket, I will now head out for the last major long run before entering long run taper mode and reducing the mileage total after next week. I am not yet where I need to be but I'm confident that the final sharpening period will enable me to aim for a precision landing on November 1st.